Flowers and baby bunnies and plants galore! Spring fever hit us hard this weekend. BAM! Like that f&%*ing local bus that tries to hit me every day on my morning commute. BE NIMBLE OR DIE is my mantra. 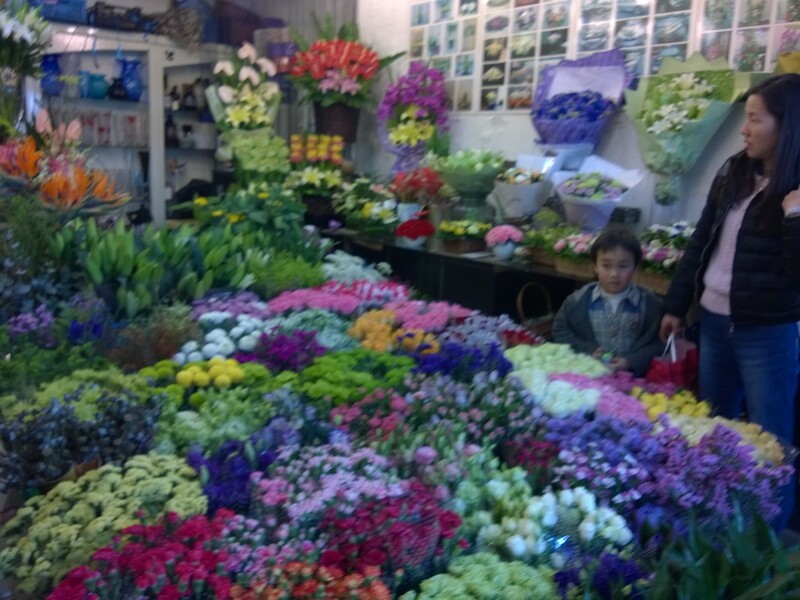 And with sunny, 60+ degrees and somewhat blue skies (with the layer of pollution, they are never quite all blue), we felt revived and nimble so we shopped at a few local flower shops but decided to check out the flower market we had heard about before we purchased anything. Dreams of lounging in Ikea patio chairs surrounded by fragrant flowering plants while enjoying a glass of wine…ahhh….now, if you could do that without being coated with grey dust and dirt from the pollution, it would be perfect. Oh well, maybe there will be a day or two to enjoy our patio. One can hope and dream. After investigating where this market was located, we got a taxi and set out to explore. Not so far from our apartment, we found the multi-level green market and happily spent the next hour wandering the many stalls of plants, cut flowers, furniture, frame shops and pets aka lunch. My only wish was that I had a minivan at my beck and call to haul home LOTS of gorgeous plants. Alas, we are at the mercy of our feet or, if lucky, possibly a cab. We tried to negotiate pricing using my Chinese bargaining terms but found that the pricing, at least for Laowais, was pretty set. I got a few Yuan off my glass terrarium, my daisy bouquet and our bonsai planter. We didn’t know if we would find a taxi to take us home so we bought greenery “lite”. Good thing too because we did end up walking a mile or two in the sunshine back home with our new greenery. While we loved seeing the turtles, fish, bunnies and other small animals, we know many will not end up as pets but rather as the main entrée or appetizer. I couldn’t stand it so I walked away quickly in denial. 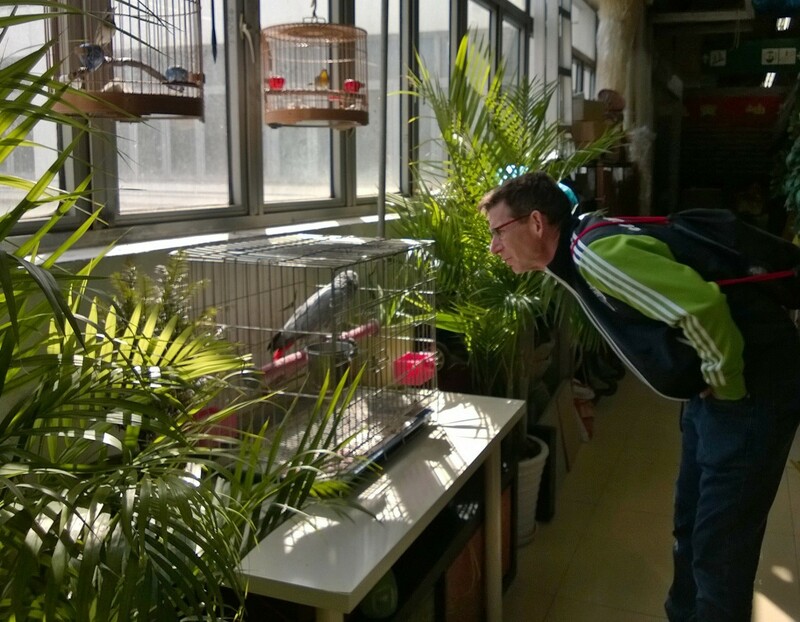 Thom, the bird whisperer, had a lengthy conversation with a parrot. Are you surprised? Parrots=tastes like chicken. Sorry, Thom, I know you like chatting with them. On the upper floors, there were many art galleries, framing shops, furniture stores and all the silk flowers. One side of the buildings was strictly for plants with huge bonsai trees that would require a crane AND a minivan to get home. Not today. On the other side were all the cut flowers. What I loved the most were these tiny hanging terrarium on ribbons. I think I may just have to go back and buy a few to hang from our curtain rods. Too cute! 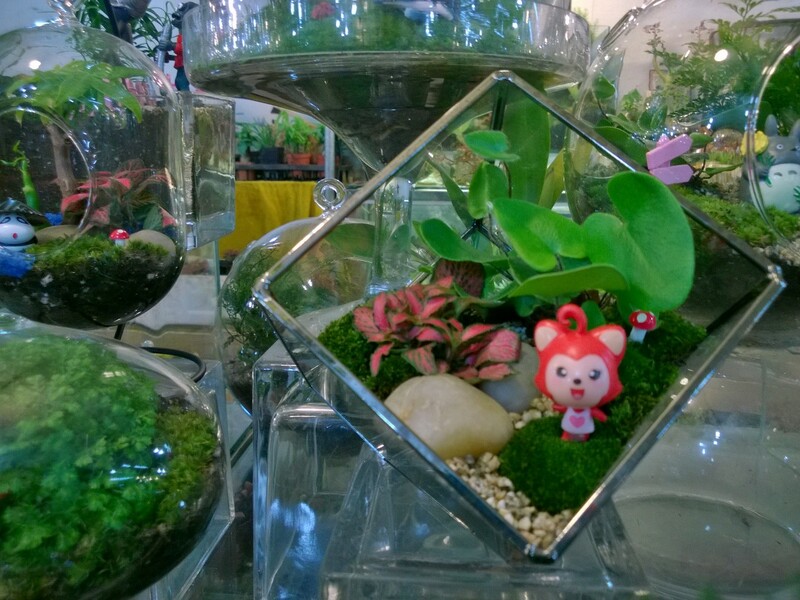 Terrariums are back from the 70’s with a vengeance!